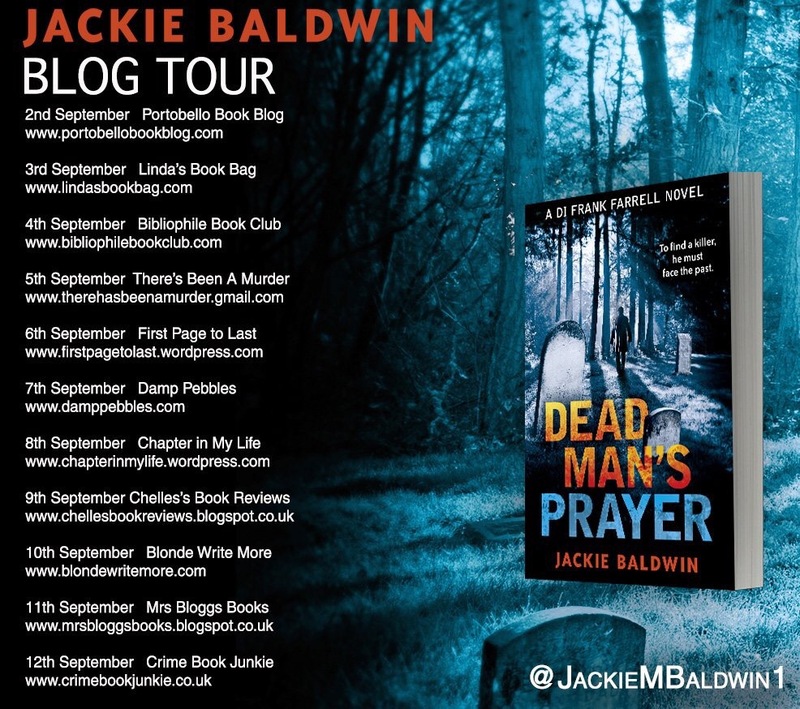 Today I’m delighted to be joined by Jackie Baldwin for a Q&A in the week that her novel, Dead Man’s Prayer has been published as part of the blog tour! Ex-priest DI Frank Farrell has returned to his roots in Dumfries, only to be landed with a disturbing murder case. Even worse, Farrell knows the victim: Father Boyd, the man who forced him out of the priesthood fifteen years earlier. With no leads, Farrell must delve into the old priest’s past, one that is inextricably linked with his own. But his attention is diverted when twin boys go missing. One twin is recovered in an abandoned church, unharmed. But where is his brother? As Farrell investigates the two cases he can’t help but feel targeted. Is someone playing a sinister game, or is he seeing patterns that don’t exist? Either way, it’s a game Farrell needs to win before he loses his grip on his sanity, or someone else turns up dead. Jackie Baldwin practiced as a solicitor in a rural town for twenty years specialising in family and criminal law. She then trained as a hypnotherapist and now works from home. She is married with two grown up children and loves to walk with her two dogs in local forests. She is an active member of her local crime writing group. Jackie is on Twitter @JackieMBaldwin1 and also has a Facebook page at Jackie Baldwin Author. First of all Kate, I’d like to thank you for inviting me on to your lovely blog. To be honest, it was long and frustrating. I was tempted to give up so many times but I’m really glad now that I persevered. I started the book back in 2005 and submitted it to some agents a few years later. A few requested the full MS and gave me some favourable feedback but none took me on. I stopped writing for a few years then got a shot in the arm from a weekend of crime writing masterclasses in Gretna and embarked on a major re-write. This annual event, called ‘Crime and Publishment,’ developed into a supportive community of crime writers with an active Facebook group. Towards the end of February this year, someone posted that Killer Reads were open to submissions. Not really thinking anything of it I sent off my book expecting the inevitable rejection to follow. Two weeks later I was holding a publishing contract. I was completely shocked! What made you choose to write a crime thriller? At the time I embarked on this insanity, I had a demanding job and two young children. I thought it would be easier to write about what I know. What did I know about? Not a great deal, seeing as how I was living a low key, fairly rural life. I had attended the local convent school, was a solicitor practicing criminal and family law and lived in Dumfries. A crime novel, utilizing that background seemed the obvious choice. Also, faced with that initial scary expanse of white paper to fill, I felt that a crime novel could supply me with the scaffolding to hang my story on. How would you describe Dead Man’s Prayer to readers who have yet to pick it up? It is a police procedural featuring former RC priest, DI Frank Farrell, who returns to his home down in Dumfries to find a local priest has been murdered. That priest had forced him out of the priesthood years ago and he must delve into the life he had left behind to catch his killer. Twin boys are abducted and Farrell starts to see recurring patterns. Is someone messing with his head or is he losing his grip on reality? He must push himself to his limit and beyond to try and prevent any more deaths. Well, as I have only been published for 3 days, I’m not quite sure yet. I love the idea of people engaging with my characters and caring about what happens to them the way that I do. If that happens then that will be my favourite thing. I am not an extrovert so having to be a bit more visible has been challenging. At times I feel I have left my comfort zone in another country. It is gradually getting easier though. Eventually you might see me dancing on the table at Harrogate. Seriously, nobody put money on that. Never going to happen! I would hope to have written between 5 and 8 new books. I was terribly slow off the starter’s block with this one but I have really got the bit between my teeth now. I am working on the next DI Farrell novel. I am also writing notes for 3 other different books that I am burning to write. There is one that, for me, stands head and shoulders above the rest and that is ‘Pride and Prejudice,’ by Jane Austen. I rarely reread books but I have been back to that one many times. Plenty. I could go on all day. I will content myself with three. These are, ‘The Shut Eye’ by Belinda Bauer, ‘Perfect People,’ by Peter James and ‘Missing Presumed,’ by Susie Steiner. I work from home as a hypnotherapist, which I love. I also enjoy walking my dogs in one of the local forests. I have a very unlikely gym habit. Having been resolutely unsporty for all my life I joined a gym 7 years ago and got addicted to the classes there. Not that you’d think it to look at me. I particularly love, spin, body combat and body pump. From being a total weakling I now nearly burst a blood vessel lifting weights. Who’d have thought? My ambition is to beat my son and husband in an arm wrestling competition. Recently, my son pretended I had him. I really thought it was going to happen and got really excited until he suddenly started trying and crushed me once more. I also love going to the cinema and watching sci-fi on the telly. I just love to go on holiday so that’s a tough one. I would have to say Mexico because the wildlife is so amazing there and I am passionately in love with iguanas. Watching iguanas doing their thing just lights me up. The Galapagos Islands are on my bucket list. My husband’s chilli con carne. I would like to say water but it’s actually red wine. Huge thanks to Jackie Baldwin for joining me on the blog and for answering my questions! Dead Man’s Prayer is out now and you can get a copy by clicking here.